The speed and rapid decrease in installation costs over the last two years have made solar technology investment, a long-term necessity. 1. The necessity for homes and business to reduce dependence on escalating energy costs. 2. The need for governments to invest in the new technology industry, to create employment and long-term energy security. 3. The obligation to protect global agriculture from the effects of global heating. Business and commerce based on oil is slowly dying through gradual strangulation. Even without the banking crisis, the problem of an economy based upon oil is now viewed or should view as short-sighted. Like the Roman civilisation whose early growth based on a military campaign and colonisation, must have thought the world and resources outside of Italy were limitless, sound familiar? If we, as a civilisation, cannot begin the necessary transition to move to alternative sources of energy, then the prognosis for modern humans is dire too. The economic landscape has changed beyond recognition since the power of money has moved from West Europe to East Asia over the last decade. Imagine a world where the flow of oil did the same. This situation is not out of the realms of possibility anymore. The economic and environmental landscape is changing and changing fast. China already holds the majority stake in the rare Earth metals, which are needed to manufacture solar panels and other alternative technologies, with a land grab of African territories currently underway. It seems the Chinese are already preparing for future resource shortages. Our western governments need to get a grip while we have the capabilities to do so. The prospect of an energy crunch, maybe only, a Chinese, backroom deal with the Middle Eastern regimes away from reality. As the economy looks increasingly doomed, the need for western governments to seise the moment and treat these threats, with the same scale we did during the world wars. The difference this time will be spent on PV solar panels and alternative energy rather than guns and tanks. The threat of the cold war took humanity to the moon. Imagine how quickly we could solve the three most significant problems of our generation, if our governments and people, got behind and took action against threats even worse than Nazi Germany. The economy depends on growth. 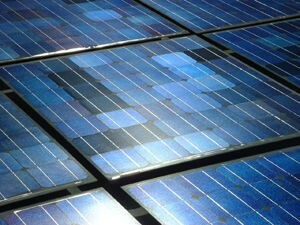 Growth in the PV solar panel industry viewed the new munitions industry for the 21st-century. If only we had leaders with this type of foresight and a dream. Until then, we must act as individuals.